Masking a car prior to a respray in the 1930s. Homepage. This page: Just the job for any pre-war motorist preparing their old car for a re-paint. 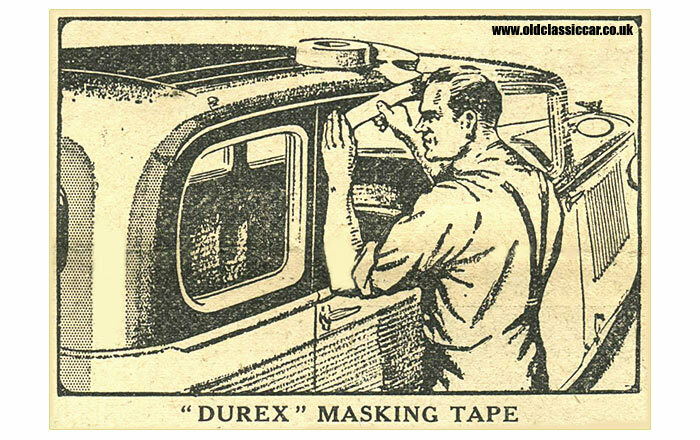 Although products of this brand are known today for other purposes, in the 1930s, Durex was a brand of masking tape. Anyone planning to tickle up their scruffy Austin 7's paintwork in the pre-war years would think nothing of popping down to their local motor factor, and asking for a roll. Listed amongst the product's attributes was the following: "Very strong and yet so flexible that it will take up the shape of any moulding or angle. Supplied in rolls 36 yards long x 1 in. wide." The advertisement shows a chap in his overalls masking a car's paintwork, prior to reaching for a tin of Valspar enamel paint. See more gadgets and motoring accessories.